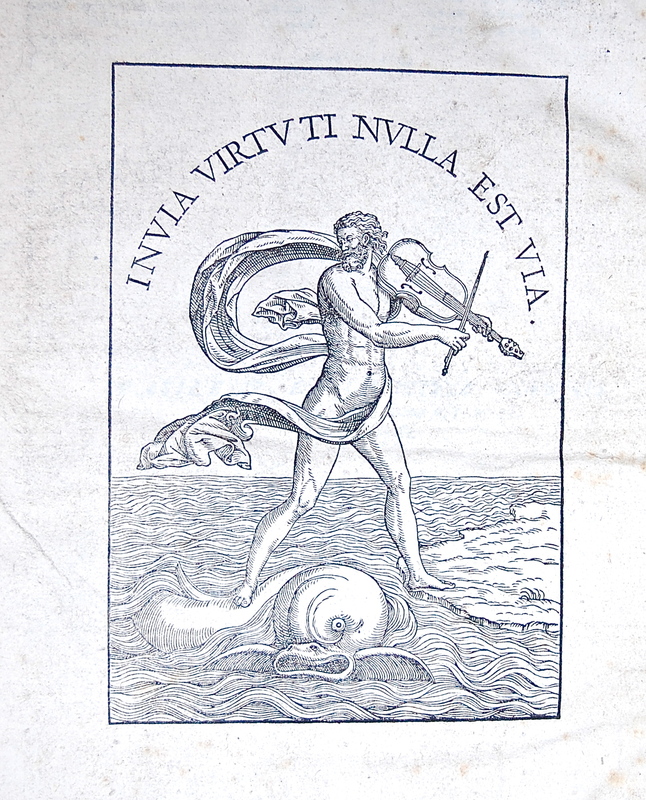 The Fourth Crusade: Invia virtuti nulla est via [Ovid] No way is impassable to virtue. It is my experience that is is not often that the printer’s device matches the subject of the book, but in this case Opornius’ device is fitting and optimistic for a History of the Fourth Crusade from the Byzatine perspective. Nicetae Acominati Choniatæ, magni logothetæ secretorum, inspectoris & iudicis veli, præfecti sacri cubiculi : LXXXVI annorum historia, uidelicet ab anno restitutæ salutis circiter MCXVII, in quo Zonaras desinit, usque ad annum MCCIII, libris XIX descripta, quorum hic ordo est I liber de rebus gestis Ioannis Comneni, Alexij filij, quem uulgò Caloioannem uocant. 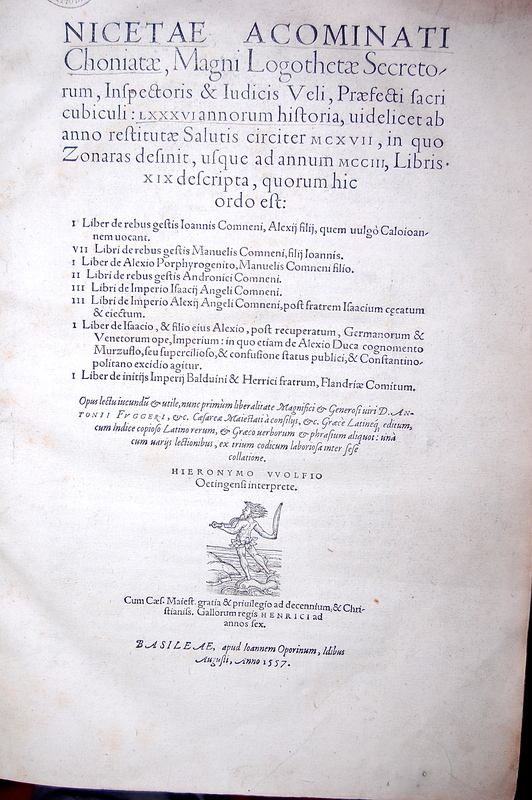 VII libri de rebus gestis Manuelis Comneni, filij Ioannis. I liber de Alexio Porphyrogenito, Manuelis Comneni filio. II libri de rebus gestis Andronici Comneni. III libri de imperio Isaacij Angeli Comneni. III libri de imperi Alexii Angeli Comneni, post fratrem isaacium c catum & eiectum. I liber de Isaacio, & filio eius Alexio,post recuperatum, Germanorum & Venetorum ope, imperium: in quo etiam de Alexio Duca cognomento Murzuflo, seu supercilioso, & confusione status publici, & constantinopolitano excidio agitur. I liber de initijs imperij Balduini & Herrici fratrum Flandriæ comium. Folio, 14 ¾ X 9 ½ inches. 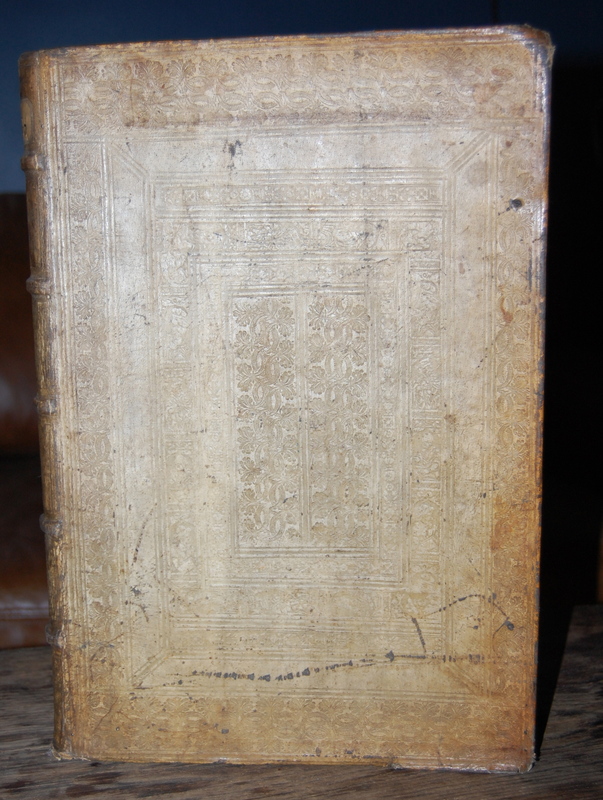 å4, 4a-z6A-F6G8 This copy is bound in its original blind stamped pigskin binding. Geographic: Latin Empire, 1204-1261 — History. Byzantine Empire — History — Angeli, 1185-1204. Byzantine Empire — History — Comneni dynasty, 1081-1185. Nicetas , sometimes called Acominatos, was a Greek historian – like his brother Michael Acominatus, whom he accompanied from their birthplace Chonae to Constantinople. Nicetas wrote this history of the Eastern Roman Empire from 1118 to 1207. Nicetas Acominatos was born to wealthy parents around or after 1150 in Phrygia in the city of Chonae (near the modern Honaz in Turkey). Bishop Nicetas of Chonae baptized and named the infant; he was later called “Choniates” after his birthplace. When he was nine, his father dispatched him, with his brother Michael, to Constantinople to receive an education. Niketas’ older brother greatly influenced him during the early stages of his life. He initially took up politics as a career, and held important appointments under the Angelus emperors (amongst them that of Grand Logothete or Chancellor) and was governor of the theme of Philippopolis at a critical period. After the capture of Constantinople during the Fourth Crusade in 1204, he fled to Nicaea, where he settled at the court of the Nicaean emperor Theodore I Lascaris, and devoted himself to literature. He died c. 1215–16. His chief work is This History, in twenty-one books, of the period from 1118 to 1207. In spite of its florid style, it is of value as a record (on the whole impartial) of events of which he was either an eyewitness or which he had heard of first hand (though he should be balanced with the other Greek historian for this time, John Kinnamos). Its most interesting portion is the description of the occupation of Constantinople in 1204, which should be read with Geoffroi de Villehardouin’s and Paolo Rannusio’s works on the same subject. His little treatise On the Statues destroyed by the Latins (perhaps altered by a later writer) is of special interest to the archaeologist and art historian. His theological work, (Thesaurus Orthodoxae Fidei), although extant in a complete form in manuscripts, has only been published in part. It is one of the chief authorities for the heresies and heretical writers of the 12th century. Nicetas Choniates provides the sole major Byzantine account of the sack of Constantinople by western Christian armies during the Fourth Crusade. Other sources include the minor account of the Byzantine eyewitness Nicolas Mesarites, as well as the crusader sources of Geoffroy de Villehardouin, Robert of Clari, and Gunther von Pairis. His work details both the Third and Fourth Crusades, but is especially valuable as an eyewitness account of the Fourth Crusade. Nay more, a certain harlot, a sharer in their [the crusaders] guilt, a minister of the furies, a servant of the demons, a worker of incantations and poisonings, insulting Christ, sat in the Patriarch’s seat, singing an obsene song and dancing frequently. Nor, indeed, were these crimes committed and others left undone, on the ground that these were of lesser guilt, the others of greater. But with one consent all the most heinous sins and crimes were committed by all with equal zeal. Could those, who showed so great madness against God Himself, have spared the honorable matrons and maidens or virgins consecrated to God? Here is more than a little bit on the fourth crusade! The Fourth Crusade is one of the most important of all the major crusades. It is also one of the most complex and certainly one that is easily misunderstood, or at least is often understood in much too simplistic a manner. The general outline is this: the Third Crusade having failed in its essential objective of recovering Jerusalem, the popes almost immediately began preaching a new crusade. This turned out to take longer than anyone wanted, for a variety of reasons. By the time a new crusade was really under way, soon after the turn of the century, events were afoot in Constantinople that would cause the Fourth Crusade to take a dramatic turn away from Palestine. The Fourth Crusade did not recover Jerusalem–in fact, it never even made it to Outremer; rather, the Crusaders ended by attacking Constantinople, driving out the Byzantine Emperor, and installing one of their own in the ancient capital of Constantine. Conquering Constantinople was hardly on the agenda when the Fourth Crusade began. How could things have gone so wrong? Was it a case of severe muddle-headedness? Or was it cynical opportunism from start to finish? Or (hush) was it a conspiracy? The options are many, the players in the drama myriad. There is really nothing for it except to dive into the politics of Byzantium in the 1190s, as well as looking at the pontificate of Innocent III, the mess the Holy Roman Empire was in after the death of Henry VI, and the role of Venice as the actor on the center stage. If you come out the other end shaking your head and still a bit befuddled, rest assured you won’t be the only one feeling that way! The Comnenus family was ruling Byzantium in 1095, when the First Crusade began, and they were still ruling ninety years later. The last of the Comneni was Andronicus Comnenus, a fellow with a most remarkable history behind him before he ever ascended the throne, in 1182. He ruled with a heavy hand, was widely hated, and when the provinces rebelled, the people of Constantinople rioted and killed Andronicus in 1185. He was succeeded by Isaac II Angelus. Isaac had his hands full. Bulgaria rebelled successfully, as did Serbia. A few years later, Frederick Hohenstaufen marched through his lands with a huge army; Isaac was unable to prevent the Emperor from temporarily capturing both Adrianople and Philippopolis. In the end, Frederick continued on, but only after Isaac pretty much granted him everything he wanted. He managed to recover a bit of lost ground in the ensuing years, but at the same time he lost control within the palace itself. In April of 1195, his brother Alexius III usurped the throne and had Isaac blinded. Alexius III Angelus was no more effective than his brother and was rather more corrupt. When Emperor Henry VI pressured him, he levied a special tax to buy him off. When the Bulgars rebelled again, Alexius was unable to control them. When Serbia threw its allegiance to Hungary, Alexius could do nothing. And all the while, he continued to drain the treasury. And when the Fourth Crusade drew near, he put up a token resistance, then grabbed all the money he could find and ran. Not long after Alexius made himself emperor, Philip of Swabia married Irene Angelus. Philip was the brother of Emperor Henry VI. Irene was the daughter of the deposed emperor Isaac II. Henry, as King of Sicily, was heir to all the old Norman claims to Greek territories they had once conquered. So now the Hohenstaufen had a direct interest through Irene in the claims of Isaac II over against his brother. Confused yet? Keep reading! Henry VI was in fact on the verge of asking for a new crusade, to be directed against Constantinople, after which he would command the combined strengths of the empires against Jerusalem. This scheme never got off the ground because Henry died in 1197. But the idea of somehow taking over the Greek Empire and using its resources in support of the liberation of Jerusalem was an attractive one to Westerners. They would pick it up again. In 1197, however, the Holy Roman Empire was in no position to do much of anything. Henry VI had been Holy Roman Emperor, King of Sicily, King of Burgundy, King of the Romans, and King of Italy. His son, however, was only an infant and was in no position to rule. In Germany there promptly rose two rivals: Philip of Swabia and Otto of Brunswick. Both, of course, had been elected by a faction of German princes. Neither were able to make their presence felt even in Italy, much less in Sicily, and even less could either of them contemplate going on Crusade. They might lend support but not much more. Almost immediately upon being elected pope, Innocent III decided that the papacy itself should assume the leadership of the next Crusade. He issued his crusading letter in August of 1198, sending it to all the archbishops of the West. He directed the call to arms not to kings and emperors, but to counts and barons and even to cities. The archbishops and bishops of the Church were likewise to contribute soldiers, or an equivalent amount in money. The tone of the encyclical makes it clear that Innocent believed the Church itself was the true leader of the Crusades. Even so, he wrote separately to the kings of France and England, ordering them to cease their war. Not, you will note, that they should go on crusade themselves, but only that their quarrel should not interfere with the raising of troops and money for the Crusade. He likewise sent a papal legate to try to persuade Genoa and Pisa to make a truce between them, for much the same reasons, except that he wanted the Pisans and Genoese to participate in the Crusade. The original date set by Innocent for the departure of the Crusade was March 1199, but no one left. Richard and Philip declared a truce, but Richard died soon after, and the war between England and France was on again. Preachers preached, Innocent wrote more letters and tried to raise money, but still nothing much happened. Only in November 1199 did the first significant lords take the cross and formally commit enough men to the enterprise for it to be called an army. Almost immediately, Innocent began to lose control of the Crusade. He had intended for the Crusaders from all over Europe to assemble at Venice, where that city would agree to provide the ships to transport the hosts to the Holy Land. This service would not be free, of course; but only Venice could even contemplate building enough ships to carry an entire Crusader army. Innocent had asked Venice to participate in the Crusade, but this matter of being the primary provider of transportation was something arranged between Venice and the lay lords. From that moment on, the course of events were affected far more by Venice than by the pope. Venice in 1200 was the richest city in the West, and one that had a direct interest in developments in the eastern Mediterranean. The city was ruled by a tightly-knit upper class of merchants and property owners, who were represented by the Doge, an executive who was elected for life by a small ruling council. The city’s wealth came almost entirely from its role as an entrep�t, moving goods from the eastern Mediterranean to Lombardy and over the Alps to northern Europe. She ruled much of the Adriatic and had outposts on the Dalmatian coast and in Greece. She also had significant trading interests in Outremer. She even had a major colony of merchants in Alexandria, even though that was a Muslim city. Relations with Constantinople were not good. Venice had long enjoyed special trading rights in the city, but lately she had seen her privileges erode. Emperor Manuel had ordered a mass arrest of Venetians throughout the Empire in 1171, and all Latins in Constantinople were massacred in a paroxysm of anti-Western sentiment in 1182. Isaac II had renewed their privileges, and so had Alexius III, but the latter did so only for form’s sake. In practice, he had been harassing the Venetians and favoring Genoa and Pisa. This was the situation in 1201, when six representatives of French lords arrived in the city to negotiate a deal. They wanted Venice to contract with them to carry the Crusader army over the sea, and they named a price. The city council thought about it for a few days, then made an even more generous offer in return, offering to become an equal partner in the enterprise. The city agreed to provide ships for 4,500 knights and their horses, 9,000 squires, and 20,000 foot soldiers. There was a formula for calculating the price for each type of soldier, and the whole price came to 94,000 marks. This was to be paid in installments, and the fleet was to be at the service of the army for one year and was to be ready by June 29, 1202 (the following year). In addition, Venice would supply fifty warships, and would share equally in any conquests. Clearly Venice wanted to do more than just provide transport, which was all the original offer contemplated. She saw an opportunity to win territory. Since the French and Venice agreed secretly that the object of the Crusade would be Egypt, the city was probably thinking of the great wealth of that country and what a prize it would be should Venice be able to win half of Alexandria or Damietta or even Cairo. The first Crusader army formed in a gallant, chivalric manner, as a by-product of a tournament help in Champagne in November 1199. The count of that land, Theobald, hosted a grand event that was attended by knights from all over northern France. As part of the festivities, Count Theobald and Count Louis of Blois took the cross. Champagne and Blois both had a long crusading tradition, and the preachers had been active in northern France, so they were likely inspired to exert their leadership. As word spread of their deed, other lords likewise too the cross: Count Baldwin of Flanders, Theobald’s brother-in-law; Count Hugh of St. Pol, Counts Geoffrey and Stephen of Perche, and many others besides. Theobald’s older brother, Henry, had participated in the Third Crusade and had become the King of Jerusalem, so Theobald had very close ties with the Holy Land. Before the Crusade ever left, however, Count Theobald died (May 1201). The Crusaders then chose Boniface of Montferrat (a marquisate in northwestern Italy) as their leader. Boniface, too, had close ties wtih the Holy Land. He was descended from crusaders. His oldest brother (now dead) was the father of King Baldwin V of Jerusalem. Another brother was the same Conrad of Montferrat who had saved Tyre from Saladin and who had been assassinated in 1192. Boniface brought in yet another Byzantine tie, as well. Another of his brothers, Renier, had married a daughter of Manuel Comnenus. Although he was killed in 1183, Renier may have been given rulership over Thessalonica by Emperor Manuel, and Boniface may have from the beginning had his eye on recovering what he regarded as a family estate. One other connection was made with Boniface: he was a close friend to Philip of Swabia, who was married to Irene, the deposed Isaac Angelus’ sister. So, Boniface brought to the leadership of the Crusade an interest in championing the cause of Isaac against Alexius III. The Crusaders assembled first at Soissons, then moved south to C�teaux in September, where they were joined by a large number of Burgundians. They then moved on to Italy, not in a single organized army, but in separate parties, trickling in to Venice over the course of that summer, thereby delaying the agreed departure date. Moreover, a number of leaders decided to set sail from Marseilles rather than from Venice. The number of soldiers who actually made it to Venice was far less than had been originally estimated. The result was that by autumn of 1201, the Crusaders were late and were behind in their payments, for those who did show up could not possibly pay the fee that had been set for a much larger army. The original agreement had calculated 33,500 men, whereas perhaps only 11,000 or so actually showed up in Venice. The Crusaders had assembled, but Venice was not about to transport them until it had received the amount stipulated in the contract. Crusades were crusades, but business was business. The Venetians were practical businessmen, and no one of them was more pragmatic than their doge, Enrico Dandolo. There the Crusaders sat, unable to pay for their passage, unwilling to go home, and in the meantime running up bills with all the locals and equally unable to pay those. He could not play it too tough, however, for Pope Innocent III was already angry with how matters were proceeding and would not hesitate to place the city under interdict. So, the Venetians offered a new arrangement to replace the old one. Venice had for some time ruled much of the Dalmatian coast, mainly as a way to secure control of the Adriatic and its shipping lanes. Recently, however, the King of Hungary had been inciting rebellion in the Dalmatian towns, offering them his protection. One town that had defected was Zara, which for fifteen years Venice had been trying to recover. The doge offered to delay the payment of the contract (cancelling it was out of the question). In return, the Crusaders would help Venice recover Zara. The Crusade leaders had little choice, since the alternative was to abandon the Crusade, violate their crusading vow, and return home broke and humiliated. Even so, many in the army objected vigorously, and some even refused to go. But the Doge himself took the cross, and many Venetians followed his example. Some time around now, a fortuitous concidence happened. Isaac II Angelus was blind and in prison in Constantinople, but his son Alexius IV had managed recently to escape and flee to the West. Early in 1202, as the Crusaders were preparing at last to depart (to attack Zara), young Alexius was in Italy and appealed to the Crusaders to help him drive out the usurper Alexius III and to him (the prince) on the throne. If they should do so, the young prince promised an extravagant amount of help for the Crusade–men, money, weapons, ships. This appeal fits so neatly with the agenda of the principal leaders of the Crusade that many historians have smelled a plot. We won’t enter here into that controversy. Whether through chance or through careful planning, it so happened that Bonficace of Montferrat would be glad to participate because he might recover Thessalonica; and Venice would be glad because the prince promised to restore all their old privileges and more besides; and the rest of the Crusaders could look forward to that great pooling of resources of East and West that had been repeatedly touted in crusading thought. So the agenda was set before the fleet ever sailed on October 1, 1202. The Crusaders would capture Zara for Venice, then would capture Constantinople for the young prince Alexius, and then would proceed on to Outremer. By this time, it was not at all clear whether the ultimate objective was still Egypt, for most of the leaders were no longer thinking much past Constantinople. So, off went the Crusaders, a huge fleet of over 200 ships. Zara was not a Muslim city, but was a Christian one. Pope Innocent thundered angrily in letters, specifically forbidding the Crusaders from attacking Zara. But the papal threats were ignored, and the Crusaders landed at Zara on 10 November. Not all the Crusaders thought it was a great idea to be attacking Christians as part of a Crusade. As the siege of the city began, these people finally spoke up openly. Most were eventually persuaded at a general council that they had to do this in order to pay Venice, and they took comfort in shifting the blame to the Venetians. A few, however, flatly refused to participate in the siege. Nevertheless, the city surrendered after only two weeks. The Crusade spent the winter at Zara. It was here that the army in general learned of Alexius’ offer. Again, many in the army objected and some among them refused to go any further. But most of the army stayed. By attacking Zara they had automatically been excommunicated according to Innocent’s threats, so going on to Constantinople could scarcely to any more damage. They sent emissaries to Innocent to try to be reconciled. There ensued an exchange of letters, but Innocent would bend only a little and he still forbade the Crusaders from attacking Constantinople. To no avail. The army sailed in April 1203. After capturing the island of Corf� in May, and making a few other stops, it arrived at Constantinople June 24 1203. Emperor Alexius III demanded to know what the Crusaders intended, and they replied that they intended to drive him out as a traitor. The Crusaders then appealed directly to the people of Constantinople, but the Greeks would not accept anyone who was being supported by the hated Latins. If the Crusaders were going to put their young prince on the throne, they would have to do it by force. On July 5, 1203, the Venetians were able to break the great chain that blocked the harbor, enabling the Crusaders to attack the city from both land and sea. The Franks drew up near the Blachernae palace, which lies close to the Golden Horn, while the Venetians prepared to attack from the harbor side. They built platforms in the spars of ships and put catapults on the decks. On July 17 the Crusaders attacked in force. Defending the land side was the Varangian Guard, the Imperial palace guard that was made up of English and Danish mercenaries, and they were able to repulse the Franks. But the Venetians, led by Enrico Dandolo himself (who was at least in his 80s) were able to land on the narrow beaches and reached the top with scaling ladders. They took possession of a number of towers, descended into the city and set fire to part of it. Meantime, Alexius had a assembled a large army for a counter-attack against the Franks. For some reason, however, his nerve failed him and he never made the attack. The Venetians in the meantime withdrew from the section of wall they had held, for they could not keep it without a victory on the Frankish side as well. Despite the fact that the Crusader assault had only partially succeeded, that night Alexius grabbed what wealth he could and fled the city with his daughter. Those who remained in the palace thought quickly, then brought Isaac II Angelus out from his prison cell. They then turned to the Latins and declared that since Isaac was the rightful ruler, there was no need for anyone to fight on behalf of the young prince. The Crusaders countered that they would accept Isaac if his son were named co-Emperor. It was agreed, and Alexius was crowned August 1, 1203. Alexius IV quickly found Constantinople an unpleasant place. By the time he had handed out gifts all around, he did not have enough money to pay the Venetians. The tax he levied to raise the money was bitterly resented by the citizens, who didn’t much like the Westerners who were infesting their streets anyway. The Franks were rude and violent, didn’t pay their bills, and sometimes pillaged the countryside. One group decided to burn down a mosque, but the flames got out of control and a whole section of the city burned. For their part, the Franks were angry that the great promises made by Alexius were not being fulfilled. They had turned aside from their true destination, risked excommunication, and for what? To be duped once again by the wily and treacherous Greek. Isaac II was blind and old and took little part in government. As the months passed, Alexius IV likewise steadily withdrew from public life, spending more and more time in the palace. A foreign army stalked the city, the citizens were angry and restless, and no one was steering the ship. In this atmosphere, yet another Alexius stepped forward, this one known to the Crusaders as Alexius Murzuphlus. This Alexius was a member of the Ducas family and was a descendant of Alexius Comnenus. More importantly, he positioned himself as the leader of the anti-Latin faction and so rode a popular tide. Late in January 1204, he seized power openly, murdered Alexius IV and put Isaac back in prison again, where the poor man soon died. As Alexius V, he reinforced the city’s defenses, most of the Latins having meantime withdrawn from the city to their camp across the Golden Horn. There was now open skirmishing between the Greeks and the Latins. Some time in February, the Crusader leaders decided they would again capture the city, but this time they would install a Latin as emperor. This would of course solve everything, as far as they were concerned. The long split in Christendom would be healed, the wealth of the eastern Empire would be put at the disposal of the effort to liberate Jerusalem, and no longer would Outremer be betrayed by the faithless Greeks. They had it all planned. In March a committee drew up an agreement that laid out the details. Venice would get three quarters of the booty, up to the amount needed to pay off the Crusader debt, with the remainder being divided equally. Venice would recover all properties within the Empire that it had ever held. Twelve electors, six Venetians and six non-Venetians, would then elect a Latin emperor. The Emperor himself would get a quarter of the empire, and the rest would be divided evenly between Venice and the rest of the Crusaders. A Latin clergy would be set up, and the Greek Orthodox church would be plundered to provide land and income for them. A Latin patriarch would be elected for Constantinople. The Crusaders would remain for one year in the East to assist the new Emperor; any who remained thereafter would have to take an oath of fealty to him. There were many other provisions, but this much is enough to show how influence Venice was in these events. The city essentially got first pick, with the remains being divided among everyone else. There is no word of Jerusalem in the agreement. The Emperor got a quarter of the Empire, but Venice got three-eighths. Moreover, the Emperor was utterly dependent on his vassals to defend the Empire, while Venice was essentially an independent power within it. Similarly, the Church was to have only enough property to sustain itself, with all surplus wealth being divided among the laity. It was without doubt Enrico Dandolo’s most brilliant diplomacy. The Crusaders began their assault on April 9, 1204. The initial attack was driven back and the Crusaders took a couple of days to re-group. They returned to the assault on the 13th. After some sharp fighting, the Venetians were able to go over the walls, while almost at the same time, another group broke down one of the city gates along the sea wall. Murzuphlus abandoned the city almost immediately, taking with him some jewels plus the widow and daughter of Alexius IV. The first time the Crusaders captured the city, it was done in the name of Alexius IV, ostensibly to drive out a usurper and to restore the rightful emperor. This time, however, the attack was purely one of conquest and the Latins put the city to the sack. It was the worst looting the city ever experienced. Constantinople was the richest city in Christendom, for it had been accumulating its wealth for almost a thousand years. Over the next three days, the Latins managed to carry off a great deal of it. According to the terms of the agreement, after three days, the loot was collected in great piles and apportioned out: three-eighths of it to Venice, one quarter to the new emperor, and the rest divided among the remaining Crusaders. Literal shiploads of gold, silver, jewels, art work, and sacred relics left the city that year. Between the plunder and the fires that broke out during the two captures of the city, Constantinople was ravaged so badly that it simply never recovered. It would not return to anything like its former glory until the Ottomans had conquered it and turned it into a great Muslim city. The fall of Constantinople in April 1204 marks the end of the Fourth Crusade. The Crusaders did not immediately turn the wealth of the Empire to the conquest of Jerusalem, for they were fully pre-occupied with simply preserving what they had won. They captured Murzuphlus a year later and had him killed, but rival Greek claimants appeared immediately, the most important of which were the Empire of Nicaea and the Despotate of Epirus. In addition, Bulgaria also emerged as a deadly foe, with the result that although the Latin Empire of Constantinople lasted until 1261, its knights and rulers spent the entire time fighting for their own survival. Some Crusaders stayed on, to be granted various fiefs. Most, however, returned home, brimming over with plunder. They were still technically excommunicants, but the great victory at Constantinople persuaded Innocent to remove the ban. While there were those who were bitterly critical of the Crusaders for lining their own pockets under the protection of a Crusade, the acquisition of the Greek Empire was a very great prize, indeed. Great things were expected, and disappointed on that score set in only gradually as people began to realize that the Latin Empire was turning out to be just another state, rather than a bulwark of Crusading. Rather than condemning the Fourth Crusade has a terrible travesty of a grand ideal, most people continued to support crusading and the idea of crusading. The next generation would produce more crusades than any other, for people continued to believe that all that was needed was one more large effort and the Holy Land would be returned to Christendom. Copyright 1999, Ellis L. Knox This file may be copied on the condition that the entire contents, including the header and this copyright notice, remain intact.